Bushmaster Sawback Survival Knife With Survival Kit And Sheath | BUDK.com - Knives & Swords At The Lowest Prices! 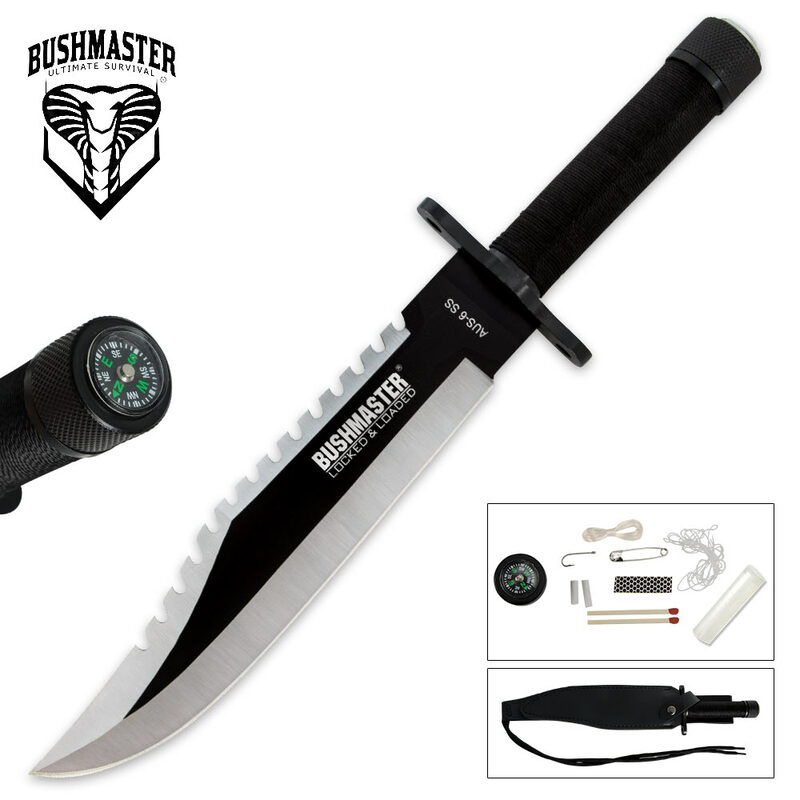 This Bushmaster Sawback Survival Knife will have your back no matter the situation in which you find yourself. 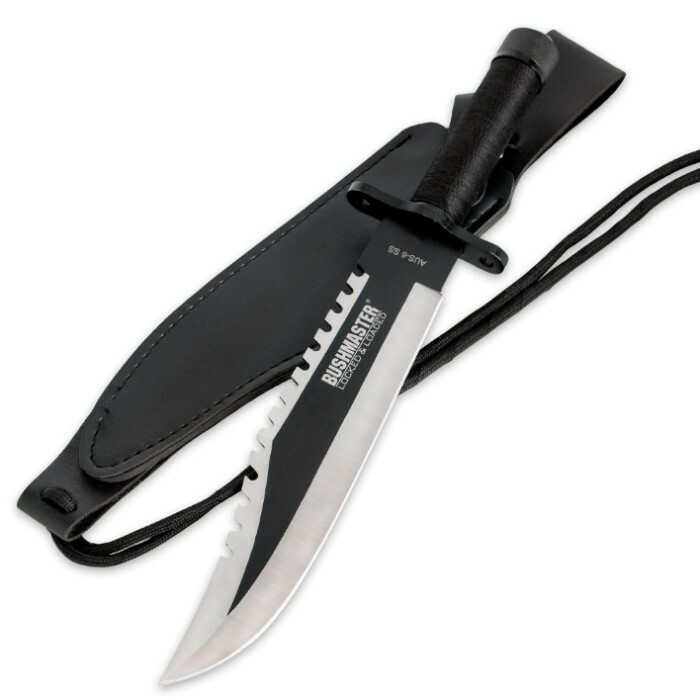 This fixed-blade knife features rock-solid stainless steel construction with a sharp edge, clip point and heavy sawback serrations. A heavy guard protects your hand from slipping to the sharp blade, and cord handle wrappings provide a secure, slip-free grip. 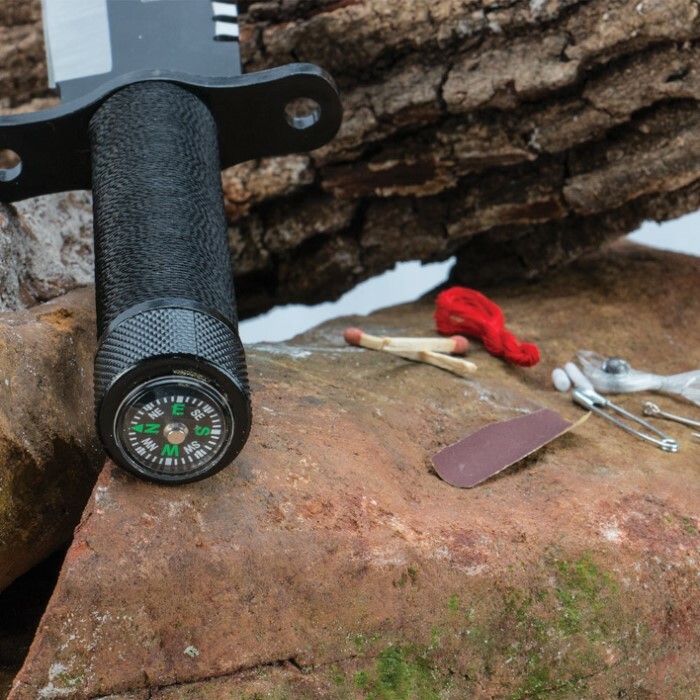 The removable pommel cap features a survival compass, and the handle houses a complete mini survival kit. The survival kit includes fishing line, a hook, sinker, matches and match striking paper. An imitation leather sheath is included. come in beautifully! really love it. The survival kit is not of the best quality, but something good to have. Thank you. The knife is great but the sheath is shoddy. After just one day, it ripped in 3 places. The blade on this knife looks awesome and mean. But what's up with the handle? The handle is so small. I feel like the handle will break off just from the weight of the blade. I haven't used this knife yet for fear of breaking it. I probably should go ahead and use it since I got this as a BOGO free. The knife itself is very good -- a few swipes with a ceramic sharpener and the edge was perfect, but the sheath needed replacing. Just to make it MOLLE compatible required Velcro, sewing, pop rivets, and Gorilla tape. And then it tore. A great replacement sheath is the Buck/Hood Hoodlum (available sheath-only, $28.00). It's long enough for this huge blade, has the most versatile MOLLE system I've ever seen, and the front buckle pocket is great for a large folding knife or, for my wife, a full-size multi-tool. When the photo on the product page (the bottom of three) shows broken stitching on the sheath (near the bottom, far edge), you have to wonder about quality control. No complaints about the knife -- I ordered another (and will get replacement sheaths elsewhere). Straight out of the box, this knife is pretty sharp. I sharpened it a little more to my liking. The weight of it is good and I like the steel. It has been useful for many camping trips. The only complaint is the compass. It's not always accurate. Sometimes you have to shake it a bit to point the right way. What surprised me as the compass works excellent and it still works and I had it for a year. If you have a 3 Edge Stone you can get this thing razor sharp. The knife and survival kit are nothing short of great, that being said my only complaint is that the sheath is obviously cheap. After only a couple of weeks the knife had cut through it, and this was discontinued so no replacement was possible. The knife being the most important thing is more than the $10. Sharp, sturdy, and not a terrible sheath. Well worth the price. Kit would do in a pinch. If you don't have one. Buy one. If you do have one. Buy another one!!! Came out of the box with a fine edge. Handle feels a bit small but is comfortable and solid. Blade is solid. Great knife for an awesome price. If you don't have one get one.